Item:�� FC1800WBHP��� Firecreek� Not in stock. Will be ordered as needed. PLEASE READ!! NOTE: Please keep in mind that the USPS has box size restrictions that will prohibit these windshields from being shipped to some countries. These are some of the countries that have restrictions; Australia, Brazil, Brunei, Chile, China, Egypt, Hungary, Iceland, India, Indonesia, Israel, Korea, Mexico, Russia, Saudi Arabia, Singapore, South Africa, Taiwan, Turkey and Ukraine. We can make arrangements to ship them via FedEx but, the costs will be much higher than the shipping costs listed. This is a Windbender HP windshield. Wind is a part of motorcycling, but getting beat up by it isn’t fun for very long. 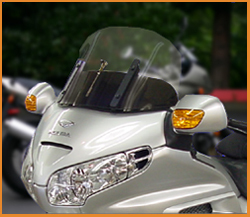 On the GL1800, wind buffeting is a constant irritation for the rider and even worse for the passenger. The raised seat for the co-rider compounds this problem and makes the challenge to correct it even more difficult. For the rider, we wanted to get rid of the constant helmet buffeting and reduce the amount that occurred when going around trucks and side winds. In addition, it was our desire to get this windshield low enough to see over it. For the co-rider, our goal was to eliminate the constant buffeting on the shoulders and helmet on normal riding and again, reduce the amount of turbulence when riding in adverse conditions. We feel that we have accomplished all of these goals. The solution was to reduce the low pressure area behind the windshield. The primary benefit is being able to create a more stable airflow around the cockpit area and a higher wind lift over the top of the windshield. With the air flow now smoothed out, the constant buffeting from the collapsing wind is greatly diminished and in most cases eliminated. The windshield base, mounts to the motorcycle just like the stock windshield. This allows for the use of the factory windshield adjustment and simplicity for installation. The wing or second half of the system is attached to the base with two adjustable brackets that allows for an additional 3" of adjustment. This also allows for the windshield to be easily removed when it needs to be cleaned. Due to the shape of this windshield, there is some distortion while looking through it. (Remember, we want to look over it.) This windshield has about 8" of air lift above the top of the windshield. We recommend adjusting the windshield so that when seated on the bike, you can see a point on the road, 88’ out front while just seeing the top edge of the windshield. With this primary adjustment as center, you can move it down even more for riding those rolling curvy roads or raise it up to a vision point of 130’ for riding down the interstate. When adjusted for interstate riding, the wind is just moving across the top of the rider’s helmet. This is important to the co-rider, because of their elevated sitting position they are going to want the wind at least above the face opening in their helmet. For this windshield to work as well for the co-rider as the rider, they have to be somewhat matched. For example, if the rider is very short in the body, and the co-rider is very tall through the body, along with the added height in the passenger seat, it may place them high enough in the wind stream that they will get some wind in their face, even though the buffeting should be reduced. This will fit all Goldwing GL1800's and F6B's from 2001-2017. Note: This is one of the few products that we do not stock. So, it could be a couple of days before this item is shipped to you. Plus, there are many different heights, styles and colors available. If interested, please call for more information.